An alternative to the common hard or flexible dental acrylic bases for partial dentures is a light alloy partial dentures which is a made up of a mix of acrylic and light alloy metal (i.e Chrome Cobalt or Titanium). 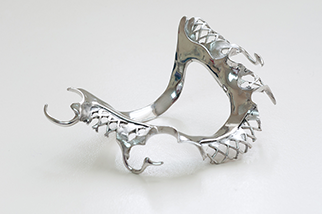 The materials have all been tested to ensure they are biocompatible for their use in your body. Light alloy partial dentures have the benefit of being lighter and less bulky than the acrylic variety and with this more comfortable to wear. With Lee’s light alloy partial dentures you gain less coverage of the tissue in your mouth which help with your oral sensitivity and taste, what more light alloy dentures are produced to be more hygienic that other types of partial dentures. "My gums are very flat but I can eat anything with these dentures that Lee has made me. I keep nagging my wife to get herself some from Lee. Still more pork crackling for me lol." "Finally, I have new dentures that fit me like a glove. They are just so comfortable and eating has become a pleasure once more." Contact Us today to book your appointment with Natural Looking Dentures services. Lee Butler, Clinical Dental Technician, Dip CDT RCS (Eng) - GDC No: 108662. GDC UK. Some treatments will require us to work with your dentist or one of our dental surgeons. E.g. Partial Dentures.